Last Easter, Ila was a tiny baby and I was barely able to leave the sofa. This Easter is very different. Ila is walking and talking and interested in everything. I want her to join in the egg hunt in our shared back garden, but I’m not very excited at the prospect of her eating lots of chocolate eggs. 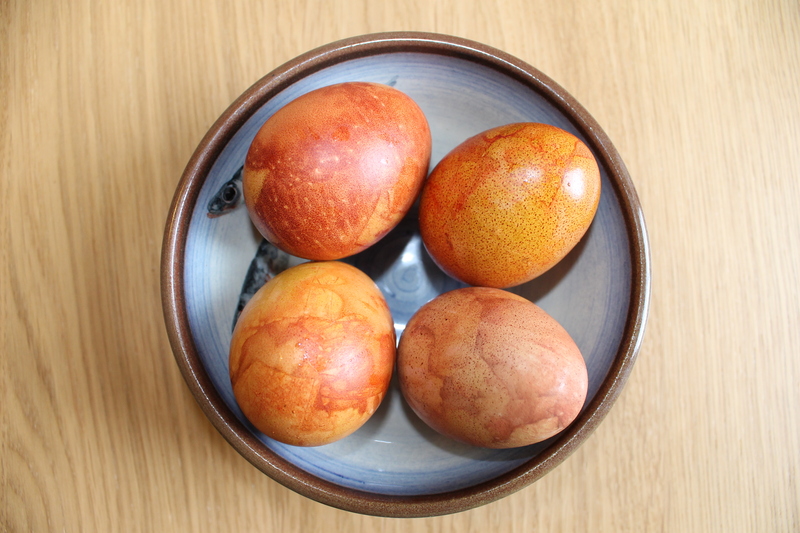 Traditional vegetable-dyed eggs seem like a better option and, unlike me, Ila is partial to a boiled egg in the morning. Wrap an egg in onion skins, covering any gaps. Holding around the skins, gently insert the egg into the foot of a stocking. (You might need to rearrange the onion skins a little once the egg is inside.) Cut the stocking a couple of inches above the egg and tie a knot in the stocking so that it can’t move about. Repeat with the remaining eggs and knotted pieces of stocking. Bring a saucepan of water to the boil and gentle lower the eggs-in-stockings into a single layer on the bottom of the pan. Reduce the heat so the water continues at a slow burble. Leave to simmer for 7 minutes. (The eggs will be slightly over-cooked, but the colours will be great.) Leave the eggs to cool in the stockings. Once the onion skins have been removed, rub a little olive oil on the egg-shells to enhance the colour and make the shells shine. The onion colour sometimes seeps through to the egg-white making it very slightly tan. I like to imagine that the eggs have an oniony flavour as well. Keep the eggs in the fridge when they aren’t being hidden in the garden.